There's really no connection between these two stories, aside from the fact that they're both about dugouts. 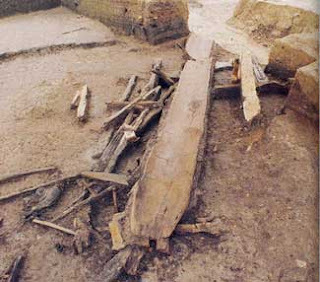 First, we have one of the oldest dugout canoes ever discovered, at Kuahuqiao in south China. Dated to 8000 years BP (before present), it's firmly in the Neolithic period, coeval with the early domestication of animals and the earliest instances of agriculture. While far from complete, the canoe and related artifacts present intriguing glimpses into this extremely early example of timber boatbuilding. Construction of the pine hull was probably done with a combination of stone adzes, which were found at the site, and fire, examples of charring being detected on the hull. Also found was piece of woven matting attached to frame of light timbers -- very likely a square sail and spars. It has been suggested that smaller timbers found near the hull might have been part of an outrigger assembly, but the upper parts of the hull, where outrigger booms would have been attached, are missing. So what was probably a sailing canoe might or might not have been supported by an outrigger. Three paddles were found in the assemblage, two of them apparently unused and placed carefully beside the canoe. This would appear to be in keeping with the notion of a ritual interment, but the absence of other ritual items beside the hull makes this notion difficult to support. Among remains of several game species at the site were those of dolphin, probably indicative that the people who built the canoe used it to hunt at sea. Here's a great video with much to teach about expanded-and-extended dugout construction in the modern era. The canoes were used to gather marsh grass, presumably for fodder. When hewing the sides, the workers tap them to test for thickness, apparently relying on the sound or feel of the wood as it's struck. The interior of the hull is tarred, and the ends are bound with withies, before the process of expanding (spreading) the hull begins. The hull is heated first over an open flame, then hot rocks are piled inside. The exterior is swabbed down with a mop, probably to prevent charring on the exterior, and also to prevent splitting. At least nine frames are hewed partially to shape, then fitted to the hull, with some adjustment to the frames and some additional spreading of the hull. The outer edge of the sheer is tarred, then caulking is stuck to it before the additional strake is added. The top strake is mostly cut to shape, then bent on apparently cold, its shape being adjusted as needed. When being paddled solo, the paddler sits in the bottom far in the stern, using a double-bladed paddle. The bow rises high out of the water. One man would manage the canoe while another walked through the marsh gathering the grass. Note the latter's use of something very much like snowshoes to prevent sinking into the muddy bottom. With the canoe weighted with a huge load of wet grass, paddling gives way to poling. Here are 94 fine photos showing contemporary bay and river life in Vietnam and the pervasive use of indigenous boat types there even today. The photos were taken by Capt. Rob Whitehurst a couple months ago, the great majority on the Mekong Delta, and the last few -- showing tall, towering rocks rising dreamlike from the water like an antique Chinese print -- on Halong Bay, close by Haiphong and not far from Hanoi. Capt. Whitehurst was our source for the Junk Blue Book of 1962, which we offer as a free download. 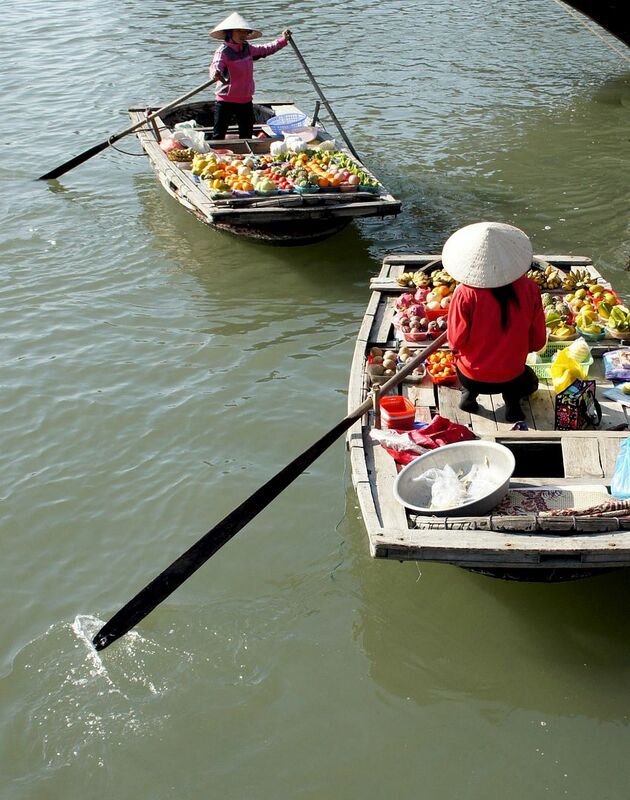 This a thoroughly detailed catalog of Vietnamese boat types compiled by the U.S. Dept. of Defense during the early days of the "American War" and well worth a look. Thanks to Rob again for these photos. 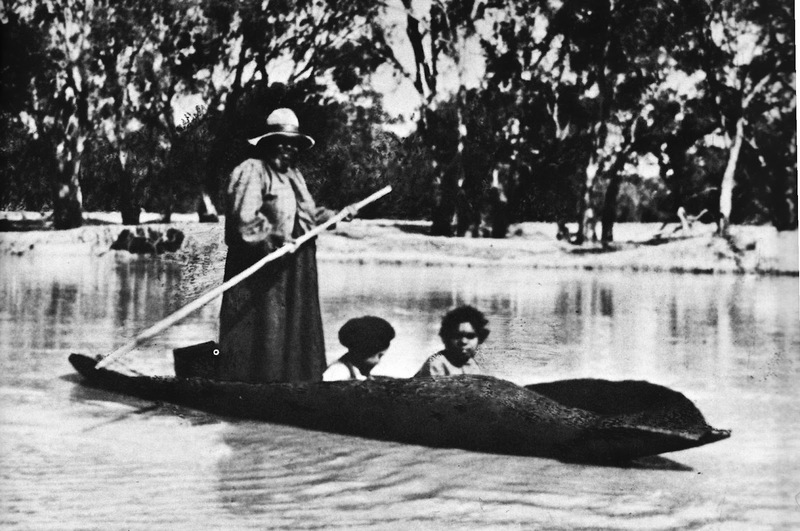 The bark canoes of the Australian Aborigines of the Murray River were among the simplest true boats ever built. Even so, they played an important role in the peoples' subsistence economy, and they had a kind of natural grace. 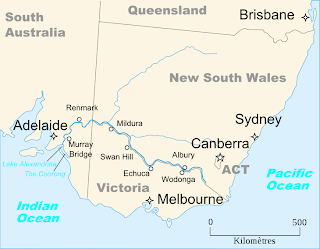 The Murray, with its major tributary the Darling, is the largest river system in Australia, running over 2,300 miles through a variety of terrain and ecosystems. It's not surprising that such a dominant geographical feature should have played a role in the material culture of a people. 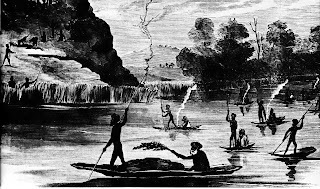 The Aborigines built bark canoes for hunting and fishing, and for transportation across the rivers in the system. 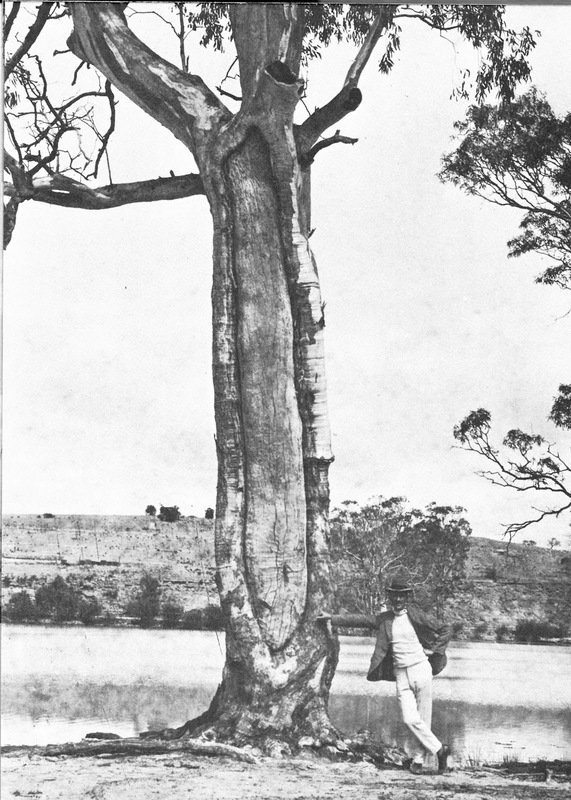 A tree from which a section of bark was cut for a canoe. 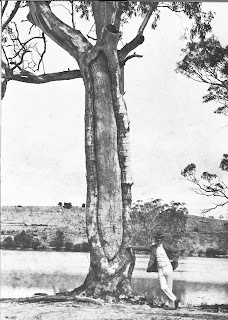 Even though no bark canoes of the type described here have been built for over 100 years, several of these slow-growing "canoe trees" still remain, showing the boat-shaped scar. Murray River bark canoe under construction. Note the prop sticks around the edges. 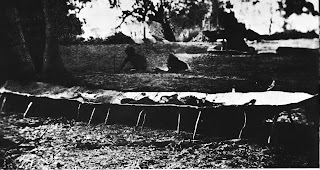 Once flat on the ground, small sticks were placed under the bark to support its perimeter edges and small fires were built on top to evaporate much of the sap. This also caused the center to sag down, increasing the curvature of the hull and the height of the sides. A few sticks were placed across the hull from sheer to sheer to prevent the bark from curling inward too far, and sometimes these were left in place, in the nature of thwarts, when construction was complete. The end of the bark that was lower on the tree was always at the stern. This was much thicker than the bark at the other end, and often it could not be bent up sufficiently. In such cases, the stern would be closed in with a transom made from clay mixed with grass or other vegetable matter. The canoes were propelled with a pole about 14' long. In deeper water, this was used in the manner of a double-bladed paddle. In shallow water, the canoe was poled, always using the thicker end of the pole against the bottom. The narrower end was sharpened and served as a fish spear. The paddler always stood, except when hunting, when he crouched. Passengers would crouch or sit. A funeral procession on the lower Murray, 1864. The corpse is in the foreground boat, covered with leaves. Note the small size and minimal freeboard of some of the canoes. Canoes varied in size from one-man boats as short as 8' to boats over 20' capable of carrying as many as eight people. A big boat might have freeboard of 8", and beam was usually around 30", rarely more than 36". Stability apparently varied, with many European descriptions emphasizing the canoes' tenderness, while at least one claimed that one could climb into a large canoe from the water, over the side, without upsetting it. There are numerous recorded instances of both Aborigines and Europeans upsetting or swamping the canoes. Most Aborigines were apparently good swimmers, and this was rarely a disaster for them. Aborigines would fish and hunt from the canoes. One fishing technique was to stir up the bottom of the muddy river with the pole in an area suspected of harboring fish. When fish then fled into areas of vegetation, the paddler would follow their progress and deduce their location by the movement of the plants, and then thrust his spear "blind," so to speak, but often successfully. For night-fishing, a small fire would be built near the bow on a platform of mud, bark and sticks. The fire would attract fish, which could then be speared by sight. One man would tend the fire, while another would handle the boat and wield the spear. 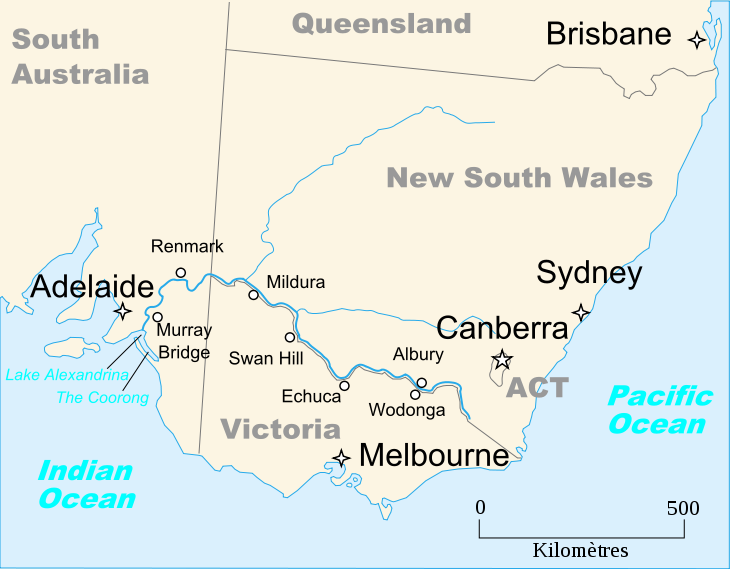 Early European explorers and settlers used the canoes, sometimes stealing them from Aborigines; sometimes acquiring them through barter or commissioning their construction, and occasionally building them for themselves after having observed the native techniques. One European recorded using a bark canoe to ferry as many as six sheep at a time across a river. Another told of carrying 400-pound bales of wool. On the Darling River, 1904. The canoe is in the South Australia Museum. Of course, as European settlement progressed, European-style boats soon came into use, and Europeans generally ceased using bark canoes. Then, as Europeans came to dominate the riverfront land, they prohibited Aborigines from taking bark from their trees, and the use of the bark canoe died out entirely.